You’ve found the perfect couch for the living room, the ideal bed and dresser for the bedroom, the most beautiful chandelier for the dining room… you’re all done, right? Well, almost! You may be done with your interior decorating, but how about exterior decorating?! With a bit of planning, you can create charming, livable spaces outdoors. These ‘al fresco’ spaces allow you to enjoy fresh-air dining and relaxing. And, they add value to your home. Finding comfortable outdoor furniture is a great start. 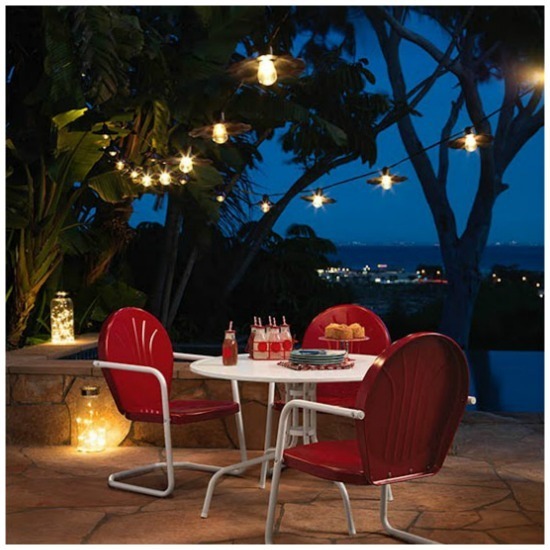 Consider a seating area where you can gather and enjoy a snack or beverage under the stars. The barbecue is another common focal point outdoors. To help set the mood, consider adding a decorative outdoor fountain. Running water is naturally calming and soothing. If you happen to live in a bustling area, the flowing water of a fountain can help mask city noise. Now that you’ve got somewhere to congregate outside, you’ll need to shed some light on your new livable landscape. With proper illumination, you’ll be able to fully and safely enjoy your new outdoor areas. Deck lighting fixtures are designed to install neatly and discreetly, and will add light while staying out of the way. Certain models can be installed atop deck posts and will fit in nicely with your existing deck design. 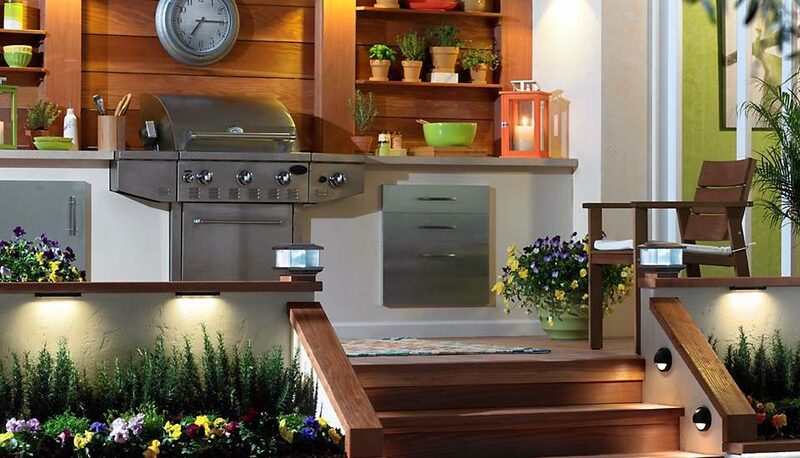 Adding light to any steps you have outdoors will make getting around easier and much safer. 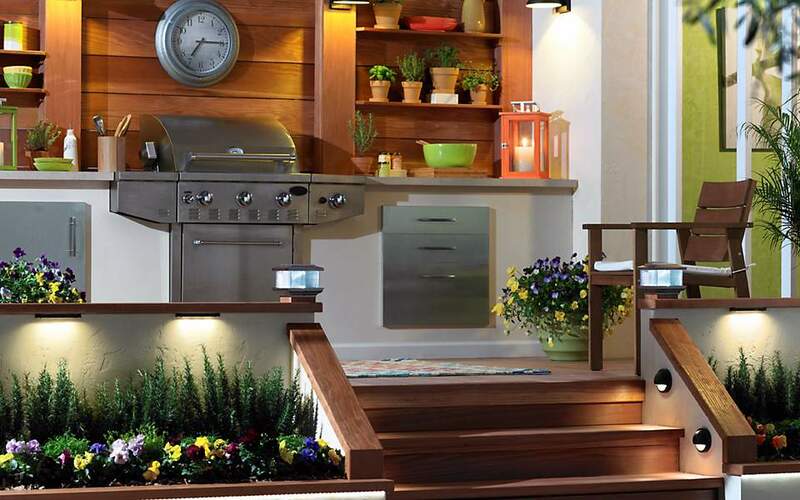 Step lights can be tucked neatly into stairways keeping everyone safer after the sun goes down. Rope lighting is another inexpensive way to add extra light to deck railings or steps. If the space you’re creating is bordered by the exterior of your home or garage, outdoor wall lighting is a great choice. These fixtures come in lots of styles and sizes, and are available with traditional incandescent fixtures or energy-efficient fluorescent. As long as you have access to line voltage, these hard-wired lights can be mounted on any wall. A stylish and sophisticated option for outdoor illumination! Whether you fancy yourself a master of the BBQ or just a weekend grill warrior, you need light to work your magic. BBQ grill lights throw focused light on your workspace giving you the opportunity to cook up a masterpiece. There are battery-operated models that offer easy set-up and can be moved, if needed. Plug-in and hard-wired models are also available for more permanent installations. For a special occasion accent, check out our selection of party lights. These sets plug in much like Christmas lights for a simple and playful decoration. Intended for temporary usage, your can string up a new set to fit the season or the mood! Illuminate and Enjoy! There are lots of stylish and functional lighting options that can help you create your dream outdoor space. Use your imagination! Our trained professionals can help with suggestions and plenty of technical help, too. Visit our stores or call one of our specialists today. For more inspiration, watch our YouTube video below to learn how to add levels of lighting to your outdoor design simply by incorporating four key lighting elements.